I love Milky Ways. My preferred way to eat them is chilled. Just pop them in the fridge and then enjoy the cool milk chocolate-y, nougat-y, caramel-y goodness. Imagine my surprise yesterday when I walked up to the Walgreen's checkout and noticed this new addition to the ©Mars family. No nougat, just caramel. Hey, I like caramel. 89¢ later, I was the proud owner of this new Willy Wonka-esque concoction. And now I'm eating it--almost 24 hours later. I call that willpower. It's good. It's less delicate than a Ghirardelli chocolate-caramel square; but, if you like caramel and don't want to splurge on the Ghirardelli OR if you're just anti-nougat (check out Kibology), then give it a shot. I think you'll like it. I need to go purge now. 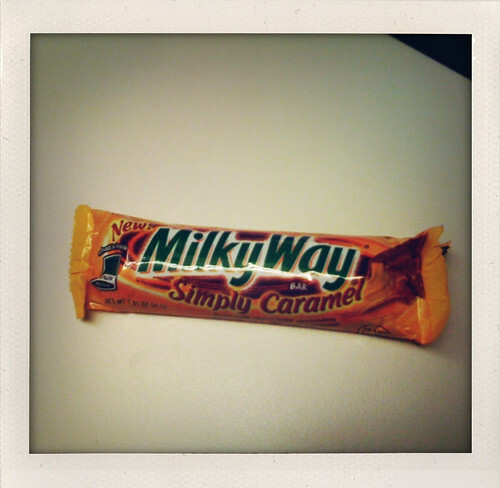 Milky Ways are my favorite candy bar, followed by 3 Musketeers and caramal Twix. Ever had a 100 Grand Bar? I have a caramal/chocolate nouget theme going on here.